Trees are great for any property. They present a great view to people who pass by the property and make for an absolutely beautiful landscape. Apart from the aesthetic value, they contribute to a constant supply of clean air and provide a point of relaxation under their cool shade. With all these amazing benefits also comes the responsibility of keeping your trees well maintained. Proper maintenance through regular trimming keeps them from becoming overgrown and looking unkempt. Tree trimming may seem like fun to try on your own it is very delicate work that should be left to professionals at Amazing Tree Services for tree trimming in NJ with the right equipment. If you have a lot of trees around, large dead branches will most likely be a regular feature in your territory. These dead branches are part of the natural growth process at times may be the result of disease within the tree. The danger lies in them falling off during a storm or when you attempt to trim them causing damage to you or your property. Damaged branches near power lines can disrupt electricity supply if they fall and damage the power lines. This will not only affect you but will also inconvenience your neighbors. Trimming your trees regularly helps to make them more attractive. There is nothing more unattractive than overgrown clustered trees on a property. Trimming also helps your tree stay strong and healthy. Removing old or diseased branches of trees helps promote new growth which keeps the tree healthy. If you own fruit trees, trimming helps to boost productivity in terms of new fruit. Having your trees attended to by a professional trimming service like ours helps to erase safety concerns over rotting branches and overgrown limbs. You can rest easy knowing that you have a backyard full of healthy trees with good structures. In picking a professional trimming service that would meet your needs, there are some key considerations before you agree terms and put pen to paper. A very key question at the early stage is whether the company has certification and insurance. As company who has been running and in business for many years, all of our technicians are certified and fully insured. Making sure you get the best deal possible starts with the pricing package of the professionals you are considering. Find out how the charges are determined whether it is based on an hourly rate or the specifications of the tree. If there are extra services like an evaluation or expert advice included for a small fee find out if it will be cost effective to take the deal. With professional tree trimming provided by Amazing Tree Services, you can save yourself the expense of buying high grade equipment that you don’t have a lot of experience using and is likely to be abandoned for the most part of the year. In the long run, using a professional service spares you the back breaking work of tree trimming and saves you time and money. To learn more about our tree trimming in NJ, or for a free estimate, please call us today at 973-343-6868. Trees are part of the landscape beauty. They also ensure that there is fresh air around your home. However, for the trees to grow healthy and be safe to the occupants that share the space, you need to hire tree service companies from time to time. At Amazing Tree Services, we know that trees are very beautiful plants to have on our properties, but in the modern world we also know that trees, if not properly inspected and treated can pose certain risks your property. We’d like to discuss what can be considered a tree service in NJ. If you left the tree to grow unabated, the chances are that the tree would grow tall and cover a wide area with its branches. It may also not look appealing. Trimming and pruning regulate its height and its width. You also get rid of diseased and dry branches in the process. Do not attempt to do this on your own especially if you do not have the right tools. Seek professional assistance. There are thousands of likely pests that may attack your trees or use the tree as their house to attack your home with devastating results. It is important that you have the tree fumigated as soon as you realize the presence of pests. Moreover, have an arborist check the tree if it looks diseased. Timely interventions can save the tree from dying or spreading the disease to other trees. If you would like to make use of the tree or space around the tree, you need to have it removed. Depending on the size of the tree, it may be a safety hazard to the occupants and the building structures around. Professional tree removal services ensure that the tree is safely removed from the site with minimal disturbance or damage to the surroundings. You may have the tree stump ground to prevent the regrowth of the plant or have the stump removed if you would like to use the area. During the times of storms, where the soil is weak, or the tree branches become very heavy, there is a real safety risk to the occupants of the area. Emergency tree services deal with either preventive tree removal or trimming if it poses an imminent risk and tree removal or trimming after it has fallen. To learn more about our tree service in NJ at Amazing Tree Services, please call us today at 973-343-6868. We will be happy to take your call. Tree cutting is a delicate process that you will most likely encounter at some point as a home owner. Trees are very wonderful and of immense benefit to the environment. Unfortunately, certain situations arise where you are left with no other option. If a tree is diseased or has become a home to pests, it is in your best interest to have it cut down. A tree that has overgrown and about to tangle in power lines for example, need to be cut to avoid hazardous damage. With these different instances in mind, tree cutting is a matter that should be entrusted in the hands of a tree cutting professional. We at Amazing Tree Services has been providing many tree and property related services for many years, we are sure we can help you if you need tree cutting in New Jersey. The process of tree cutting involves using equipment like chainsaws, grinders, trucks and axes to remove the tree from its stump. Unlike many companies, we actually own all of our machines and equipment which cuts down overall cost as we don’t have to factor in the cost of renting them. With branches falling apart and wood chips all over it is pretty technical work that should be left to a professional for your safety. When it comes to selecting a company, many people are sceptical of the many companies they may find. We understand all of these concerns and that’s why we offer lots of transparency to build trust with existing clients and potential ones. On our website we have a list of testimonials from our many satisfied customers. If you call us today, we can even set you up with estimate. Anytime you settle on a company to provide a service involving machinery on your property that poses any sort of risk you should always check if the company has insurance, and all their required certifications. Having been in business for a while, we at Amazing Tree Services are insured, and certified to work with heavy machinery, with unstable trees, and the delicate process of cutting trees. Getting a professional tree cutting company to cut your tree ensures the safety of the entire process. You have a responsibility as a home owner not to cause damage to your neighbour’s property which is most times a possibility during tree cutting. We understand all of these concerns, and are more than up for the challenges unique to your property. Our experts can assess the tree you’d like to have removed at your home. When we look at a tree we make sure to check for pests, dryness, disease, laying out all the possibilities and details for you. Enlisting the help of a tree cutting company unknown to many saves you money. Most people go at tree cutting alone in a bid to save money. This turns out to be counterproductive as it is not only tasking but requires you to pay for various auxiliary services to complete the task. Getting a great deal that encompasses cutting, removal and cleaning saves you time and money. 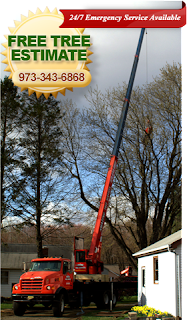 To learn more our tree cutting in New Jersey at Amazing Tree Service, please call us today at 973-343-6868. Our experts are ready to answer all your questions and handle your concerns.